The Shepherds Hut01263 715779work01603 870304fax Self-cateringThe Shepherds Hut is the perfect getaway for two to come and unwind and relax. The main room has a small kitchen area and breakfast bar and a king size bed. There is a wood burning for keeping warm and cosy on the cooler nights. You will only be 10 metres from a two acre lake - you can sit on the decked patio area, on a warm summers evening, watching the abundance of wildlife. The lake is also well stocked if you want to do some fishing whilst there. The Shepherds Hut is the perfect getaway for two to come and unwind and relax. The main room has a small kitchen area and breakfast bar and a king size bed. There is a wood burning for keeping warm and cosy on the cooler nights. You will only be 10 metres from a two acre lake - you can sit on the decked patio area, on a warm summers evening, watching the abundance of wildlife. 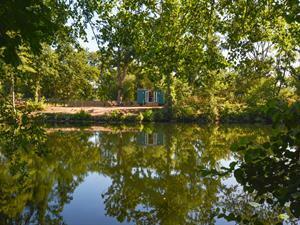 The lake is also well stocked if you want to do some fishing whilst there.